I love eTopps. I admit it. I didn't want to love them. In fact, I spent the first year of their existence avoiding them. Of course, that's because I didn't understand the concept more than anything. I had recently purchased a discounted box of "CyberAction Virtual Baseball cards" about the time eTopps came into being. So in my mind, I saw eTopps as some kind of virtual trading card. Why would I spend $4.99+ on a virtual card!? I was wrong. eTopps just handles everything virtually, but you can always request delivery of your cards anytime you want them in your hands. Which, of course, I do. 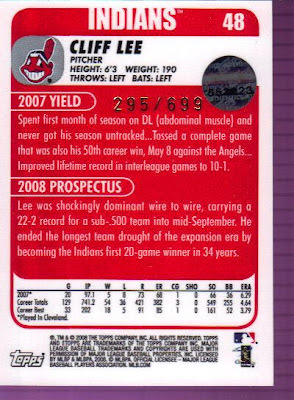 Meet the only member of the Indians to make it onto an eTopps card in 2008 - Mr. Cliff Lee. 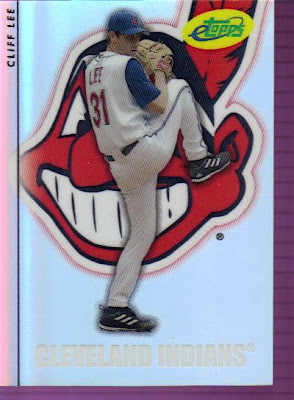 I think he's a little, well, little on this card, but the Wahoo in the back and the shiny silver card make it a beauty to behold. eTopps come in a protective slab when you request delivery. I won't stand for that, so Lee has been set free - well, until he's put in a 9-pocket page anyway. The backs are clean, discussing what happened in 2007 and what the prospectus was for 2008. Let's sum it up - He was the first Indians pitcher to win 20 games in 34 years. 'nuff said. As a side note, I am one of the rare people who liked the eTopps 'discs' that used to be stuck to the front of the cards. It gave the cards character and a bit of '3d' appeal. Nowadays, the eTopps logo is simply a graphic added to the card. I'm sure cost had something to do with it, but eTopps is very member-centric, allowing members to select card designs, offer direct feedback, etc. It's very possible that enough eToppers hated the 3d logo and got etopps to drop it. That's speculation. As a Tribe fan, of course, my big complaint is that eTopps is way too short on the players it produces for its set. Not just the lack of Indians, but the lack of a league-wide representation in general. Maybe they'll improve that this year. I wouldn't count on it. PS - I'll do a "Things Done to Cards" entry later about CyberAction cards unless someone else beats me to it. Very nice ! I never did get a single e-topps card.Like you, I would also want them in-hand.Maybe someday.I don't know if you saw the comment I added to your comment on my Heritage Indian cards, but I'm going to start working on my full want list TODAY ! Excellent! Hopefully, I can help you out with getting some of those cards off your want list!